HELP SAVE ENERGY AND THE ENVIRONMENT. Window World Windows are designed for superior thermal performance. By choosing one of our SolarZone Insulated Glass Packages, you can help reduce your energy use even more, while helping cut consumption of the fossil fuels that pollute our environment. Window World offers many ENERGY STAR® qualified glass packages. Ask your representative for more details. What Makes the SolarZone Insulated Glass Packages so Effective? Since 80% of a window is glass, substantial heating and cooling savings come from improved glass performance. Our combination of UV-filtering Low-E glass, insulating argon gas and a warm-edge spacer system creates significant energy efficiency. Together they can cut damaging UV energy, which can lead to the fading of carpets, curtains and furniture by over 75%. 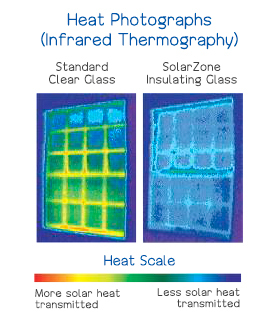 The center of glass U-Value of SolarZone Insulating Glass is 50% better than standard insulating glass. 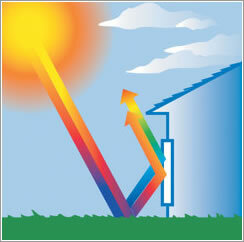 In summer, up to a 58% reduction in solar heat gain helps reduce air conditioning costs. The result: SolarZone Insulated Glass Packages can help you save on energy and cooling costs while keeping your home more comfortable. Warm-edge spacers are so energy-efficient that they keep the glass of the window warmer so your home feels more comfortable in the cooler months. Window World Windows offer two high-performance spacers which can help your home benefit from additional energy efficiencies. Traditional Box-Shaped Spacer: Heat transfer through traditional box-shaped spacers, used to separate glass layers, can increase heat loss and cause condensation to form on the edge of the glass. Warm-Edge Technology: A warm-edge spacer is designed to block the path of escaping heat far more efficiently than traditional box-shaped spacers. The result is reduced condensation on window glass. The Intercept Spacer System features a unique, one-piece metal alloy, U-channel design that creates an effective thermal barrier to help reduce conducted heat loss through the window. Its sealed, one-piece design makes Intercept spacers stronger and better at retaining insulating gas than many conventional designs. The Intercept Spacer System is nearly 25% more effective than a traditional box-shaped spacer at the edge of the glass unit. The optional Foam Spacer System is unique in its patented design. By combining a structural foam spacer with a seal of hot melt butyl to create a non-conductive edge, the non-metal Foam Spacer System eliminates any metal to glass contact, thereby increasing the edge of glass temperatures by over 16 degrees, which proves to be over 60% more energy-efficient than a traditional box-shaped spacer. A warm-edge spacer system is just one way of increasing your window’s performance. SolarZone Low-E glass is an excellent option to help increase your home’s comfort and energy savings year-round. SolarZone Low-E glass is created by applying a microscopic, undetectable metallic coating to the second surface of an insulated glass unit. This coating helps to block heat gain in the summer while retaining furnace heat and allowing warm short wave solar rays in the winter. The thermo graphs clearly show the effect that Low-E glass has when contained in an insulated glass unit. The window on the left is a clear insulated glass unit. The heat transmittance, indicated by the green, yellow and orange colors from the heat scale, is far more apparent than that of the window containing the SolarZone Low-E insulated glass unit. Low-E glass filters longwave radiation from the sun. This reduces heat gain in the summer, keeping your home cooler. Low-E takes on a new duty in winter months. It lets warm solar rays into your home while blocking the heat in your home from getting out. SolarZone: Soft coat, multi-layer, vacuum deposition Low-E glass with argon gas and Intercept Spacer System. SolarZone ETC: Soft coat, multi-layer, vacuum deposition Low-E glass with argon gas, Intercept Spacer System and carbonized ETC liners. SolarZone Elite: Soft coat, SHGC multi-layer, vacuum deposition Low-E glass with argon gas and Intercept Spacer System. SolarZone TG2: Soft coat, multi-layer, vacuum deposition triplepane unit with two surfaces of Low-E glass and two air spaces of argon gas and Intercept Spacer System. SolarZone TG2 Elite: Soft coat, multi-layer, vacuum deposition triple-pane unit with one surface SHGC and one surface Low-E glass and two air spaces of argon gas and Intercept Spacer System. Clear Insulated: Clear double-pane insulated glass unit. Single Pane: Clear, single-pane unit. Consult your Window World representative to learn about the benefits offered by the optional Foam Spacer System within your climate zone. The optional SolarZone Insulated Glass Package combines multi-layered, vacuum deposition Low-E glass with argon gas and a warm-edge spacer system. These insulated glass packages have proven to be far more effective than ordinary clear glass units. The National Fenestration Rating Council (NFRC), in conjunction with the U.S. Department of Energy (U.S. DOE), developed a rating system for window product performance. One of the most critical NFRC tests is for the window’s U-Value, which measures a window’s resistance to heat transfer. The lower the U-Value, the better the window is at resisting heat flow, which results in a window with a greater insulating value. Another critical NFRC test measures the Solar Heat Gain Coefficient (SHGC). This procedure measures how well a window blocks heat caused by sunlight. 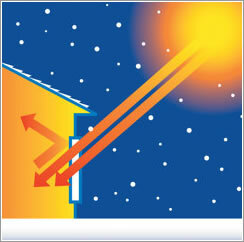 Again, the lower the number, the less of the sun’s solar heat the window transmits into the home. A quick comparison will show that your choice of an optional SolarZone Insulated Glass Package will outperform clear or lesser Low-E glass packages, leading to increased energy savings. Ready to reduce your home’s energy consumption with energy-efficient windows? Contact Window World of The Space Coast today to get started!